Sestriere is perhaps the most quintessential example of a purpose-built ski resort in this part of Europe. And that’s probably because it was the first resort of its kind to be built anywhere in the world. At the time, it was heralded as a masterpiece of modern design and development. Today, the resort itself splits the ski community right down the middle. If you’re out for an authentic mountain-village experience and any kind of local culture, try Borgata or Pragelato. But if you’re more about amenities, entertainment and access to great skiing than architecture and whatnot, you’ll no doubt find Sestriere very much to your liking! If you ask us, Sestriere gets too much stick for being a purpose-built resort. There are dozens of purpose-built ski haunts across the region that are no different – it’s just that Sestriere doesn’t do a good job of hiding it! And nor should it – it is what it is and that’s why so many skiers love it. It remains one of the highest resorts in Italy and occupies a prime plot on the Milky Way pass. And if the slopes were good enough for the World Alpine Ski Championships of 1997 and the 2006 Turin Winter Olympics…well, they’re probably good enough for the rest of us! A bit like the classic seaside towns you can’t help but love, Sestriere may be a little on the tacky side, but you’ll definitely be back for more! Sestriere is relatively easy to get to via the train. 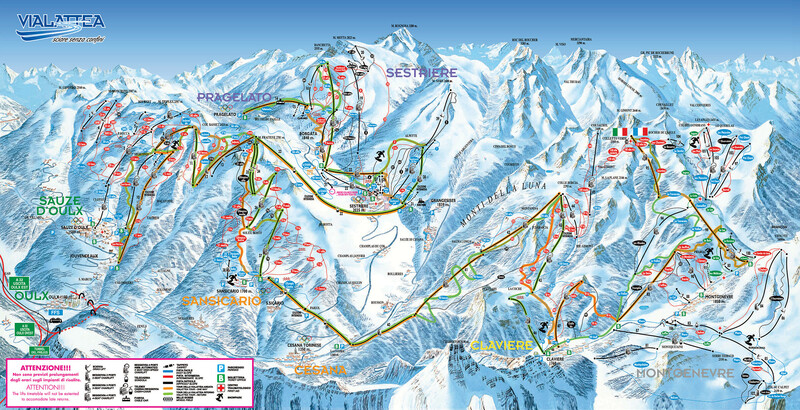 The nearest train station to the resort is Oulx which is about 20 miles from Sestriere. Head over to Snowcarbon for more information on accessing and exploring the region by train. All of the above will only ever result in our base-rate for ski transfers going down – we never over-inflate our prices at any time or for any reason. We also offer substantial discounts for off-peak, off-season and midweek transfers to Sestriere. If looking for the best possible deals, travelling outside peak season or midweek typically results in the biggest savings. We offer midweek (Monday to Friday) prices with up to 60% discount than weekend prices. The resort of Sestriere lies at an elevation of 2,035 m, with a max vertical of 1,000m and its highest lift going as far as 2,840m. Along with the above, it’s worth remembering that Sestriere is part of the Milky Way pass, which means access to 598 pistes and 933km of downhill action, right there on your doorstep. With these kinds of numbers, there’s plenty on offer to suit all tastes, styles and ability levels. As the resort is so high, it’s also usually possible to ski right in and out of your chosen accommodation. Sestriere as a whole offers wonderfully safe and friendly environment for family holidays. What’s more, there are three outstanding ski schools right at the heart of the resort - Scuola Sci Vialattea Sestriere being perhaps the most famous and capable of all. If you want to get your trip to Sestriere off to the best possible start, you need the best resort transfer services on your side. Lucky for you, Alps 2 Alps has you covered! We specialise in high-quality, low-cost Sestriere resort transfers that go the extra mile for you. We know how the quality and reliability of the transfers you book can make or break your trip – especially when travelling for short break or weekends. As always, the best deals and seats on the most popular peak-season services are snapped up fast. So we always advise booking your Sestriere resort transfers as early as possible, to avoid disappointment. If you can’t find exactly what you’re looking for, please get in touch with the Alps 2 Alps customer service team today. We’re looking forward to welcoming you on one of our services soon!